A. The Fillet Steak (NT$580) from New Zealand is tender and juicy, while the Chicken Steak (NT$300) is a good non-beef choice with crispy skin and soft meat making it very popular. 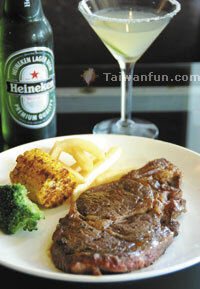 B. American Choice Rib Eye Steak (NT$480) has evenly spread fat and goes well with some grilled corn. A set comes with crispy fries, fresh vegetables, hearty salad, soup and bread. All steaks are only seasoned with sea salt to accent original beef flavors. The popular Margarita is NT$200.